The challenges of agriculture settings are the goal of Bogs Footwear's boot lines. This year's offerings from Bogs Footwear for agriculture is an impressive lineup of tough, water-fighting shoes and boots for men and women who "bog" year round to make a living. The new footwear includes models with "Neo-Tech insulation" which provides comfort, cushioning and warmth into the sub-zero temperatures. Waterproof rubber construction seals out moisture, and a contour fit provides maximum support and movement with a wide forefront and narrower heel. The outsole of the new line is made of a sturdy rubber compound designed for slip resistance, and uppers are made of Neo-Tech fiber which is 100% waterproof. Neo-Tech is a four-way stretch material that insulates and shields out water. This men's Ultra High Bogs boot is one of many farming footwear selections from Bogs this year. 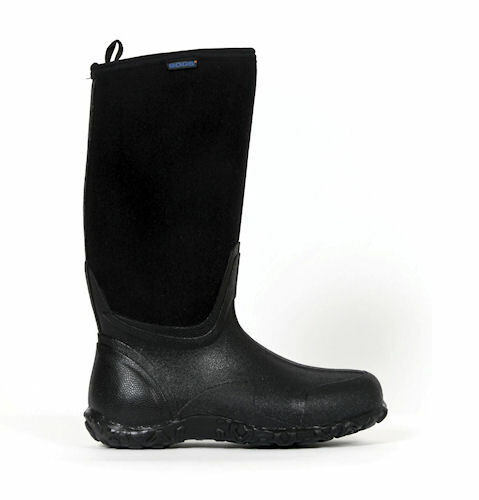 Bogs footwear is available from a number of on-line distributors. For more information on the products and where to buy them, click on www.bogsfootwear.com.